I felt like writing a few words about what I’m working on right now and what is going on with my projects. Most obviously I’m working full time on finishing our big game Else Heartbreak! You can follow the progress here. The illustrations (by Nicolai Troshinsky) for my card game Slice & Dice are also done (!!!) and I’m currently looking for a publisher. Feel free to contact me if you can help out with this. I’m also giving some courses on how to build interactive worlds and games with Unity. After leaving my job as a teacher in Skövde I haven’t had much chance to do stuff like that but I really enjoy it and want to find more opportunities for teaching in the future. This past weekend me and Danish composer Anders Monrad had an intense work-session where we made a small sound app for iPhone/iPad, it should be up on the App Store very soon (we have submitted it). Despite being very small and simplistic it’s a lot of fun to play with so be sure to try it out in a week or so. Clairvoyance is still in beta since we are focusing all our time on Else Heartbreak right now. When this intense period of work is over (February 2014) I’ll try to reach version 1.0 as soon as possible, I promise. The game is very much working as it is now though, so feel free to try it out and you’ll get the full version when that is completed. Oh, and this upcoming weekend there will be an event here in Gothenburg called Automat where there will be different indice arcade games shown. I’ll try to have some things on display, come by if you have the chance! 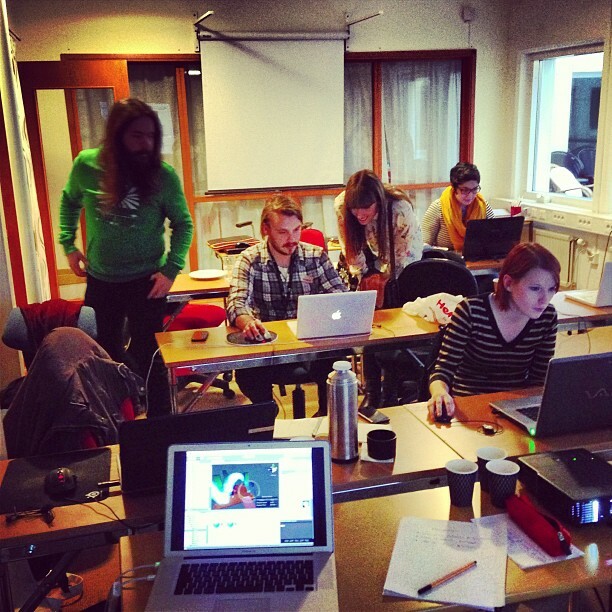 I’m giving three one-day workshops on how to create interactive worlds in Unity, 16 – 18 August. They will be held in Gothenburg at NTI Gymnasiet. More information can be found at the website for Kulturkalaset here. They will be free to attend so please tell anyone who lives nearby and who might be interested. Nevertheless it was really great to see the whole thing work out and I think that we will try some even more ambitious incarnations of this idea soon again. So if you live in Gothenburg (or can travel here) and are interested in this kind of stuff, keep your eyes and ears open!